Is it just me, or did Blizzard just use 3 different clothing models with color being the only difference? Same one for Locks, Mages, Druids and I'm assuming Priests; same one for Warriors and Pallies; and then the same one for Rogues, Hunters, and Shammies. I mean, except for the colors and the shoulders, it looks like they just got lazy. and the s4 wepon will cost 2050 PR. blizz fails again. make something new in pvp. adding another season is lazy and lame. What is going on in this WoW blizz business?!? So since the arena sets 1-3 and tier sets 4-6 are the same look with different colors, is this an insight as to what tier 7 might look like? Season 4 has been announced! There is a link to the wow forums on mmo-champion. No, you get to keep your mentally handicapped sad clown costume. At least while I look.. brutally ugly, you have to look retarded AND ugly. only thing is other colours, instead of actually doing something blizz made 4 sets in stead of the usual 9... gg blizz.. Pretty much makes Season 1 look like Greens, idk why they don't change that, these are more than epics. Blizzard sure could've hired some better fassion designers with all the money they're getting. The set doesn't look bad, but nowhere near cool and far away from S3 or T6. Ok. So, I have seen that everyone is talking about how Blizzard made awful looking season 4 items, other than some of the weapons. Most people don't know why this is, but I have recently come into some knowledge. Because WotLK has to be so great in order to keep up with the players need for new content so that they don't go and play AoC or something else, Blizzard used all of their finest programmers to make it spectacular. The others were left working on the season 4 gear. Although you may want to think that this lame uncreative looking gear will stop and we will get some more cool stuff, it won't. Blizzard is planning to fire the best programmers for new ones so that they won't have to pay them as much when WotLK comes out. You are welcome for the information. The season 4 items is not a recoloring from T7 sets. 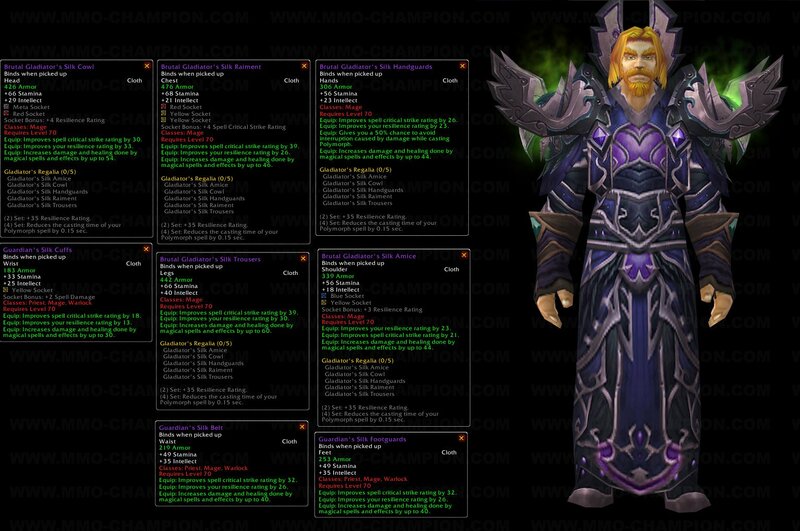 The T7 sets will be included in WotLK, not BC. 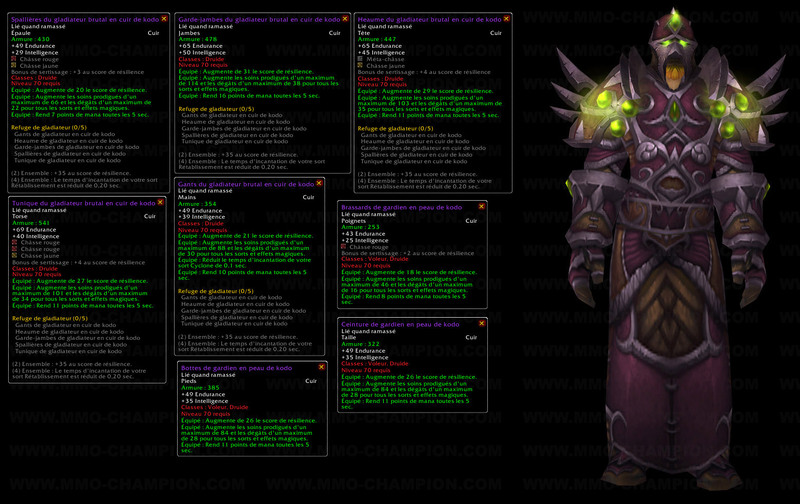 However, the s4 items is a recolour from gear obtained from Sunwell. People might call it "T7" since the armor pieces are matching as sets, yet, it gives no set bonus. This means it is not calculated as a set. There have no rating required on any piece and are sold for 1150-1500 a piece. Only requirement is they are arena point costs and level 70. For the Bored, the Role player or those who just wanted to have some really great looking sets (ones that look almost exactuly like gear from the Sunwell raid) Then this is a great chance to pick them up without having to raid and roll on gear. This is the set worn by the guard NPC's in Dalaran that are in the Underbelly. any1 knows if there is a way to obtain this at 80 ? It will cost you 805 honor for any of the level 70 Brutal Gladiator sets. It's not shown currently, but you can also get this gear from Blazik Fireclaw in the Dalaran Underbelly Sewers. Trapjaw Rix right next to him sells the Brutal weapons. Do your alts a favor and do some BGs it shouldn't take much more than an hour (depending on queue times of course) to get 1250 honor for this set, weapon, off-hand, and wand/relic. Pop in some wrath gems and enchants, you're good to go about the entirety of Northrend leveling. This isn't entirely true. Although it IS fairly simply to get this set (as well as all other pre-85 PvP sets) it will take you much longer than 1 hour (even allowing for delays). Expect to spend a FULL day doing PvP or a couple days moderately doing so. The horde in my battle group are aweful and took me about a week to get enough honor doing it for 3-4 hours a day. Each BG will take about 20-30 mins (depending on how your group functions as a team). Vendors for ‘guardian’ pvp offset pieces, rings, and neckpiece, are First Sergeant Hola’mahi in Orgrimmar , Sergeant Major Clate in Stormwind , and Vixton Pinchwistle in Tanaris . Staff of Infinite Mysteries is a perfect match for this set, it is dropped by The Curator in Karazhan! Brutal Gladiator's Regalia is the Arena Season 4 Set. It contains 5 pieces. Has a set bonus at 4 pieces.